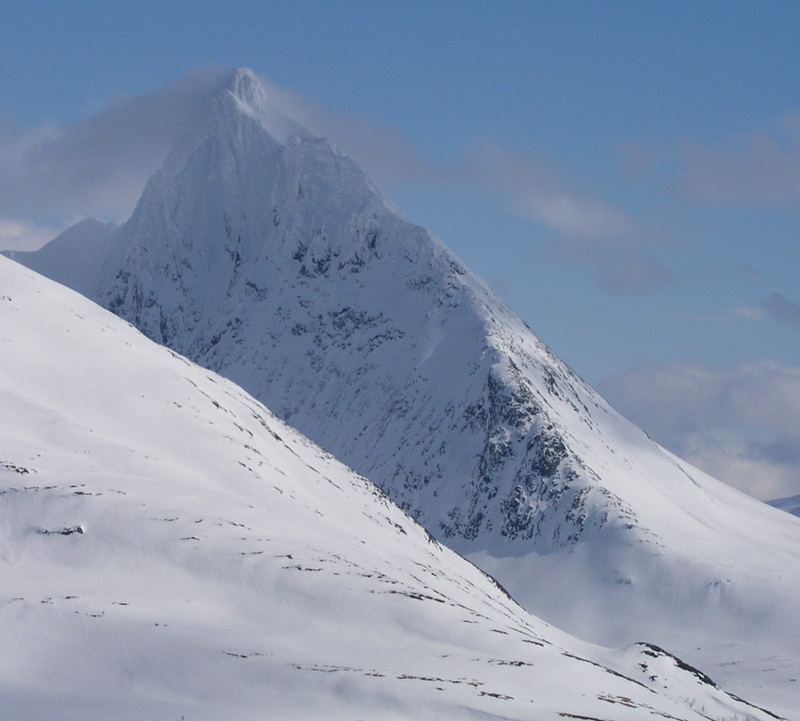 How to get there: This mountain is the local high point in the area between Lakselvdalen (east) and the low saddle connecting Balsfjorden (west) with Sørfjorden (north). 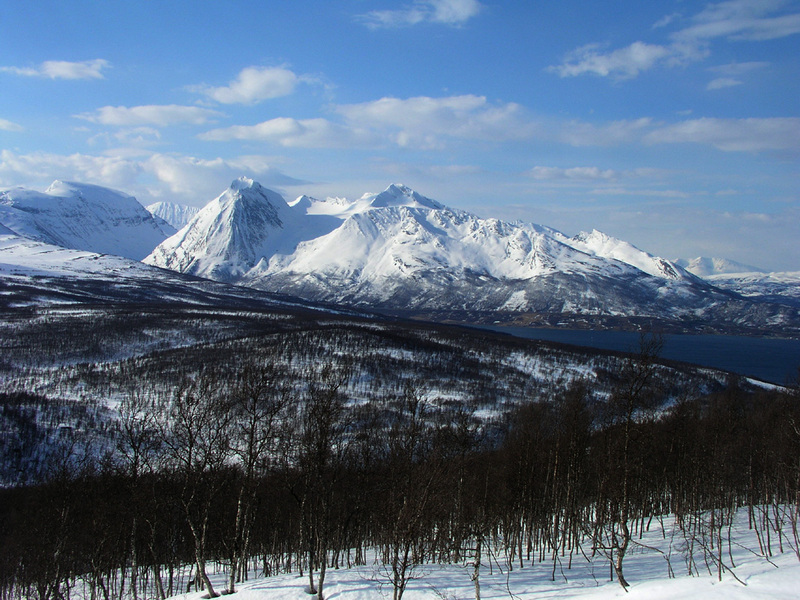 From Tromsø, drive 64 km south along Hwy. E8 to the intersection with access north to Lakselvdalen from Seljelvnes. Drive approximately 4 kilometer uphill to the highest point on the road. Before this road starts descending into Lakselvdalen, find parking on the side of the road. There is a small forest road going left at this point. This is the trailhead, precise location is north 69:17.520, east 019:27.668, with an elevation of 230 meter. Route description: From the trailhead, go more or less straight uphill towards Holmevassfjellet, you leave the trees behind at elevation 450 meter, loc. north 69:17.999, east 019:27.441. 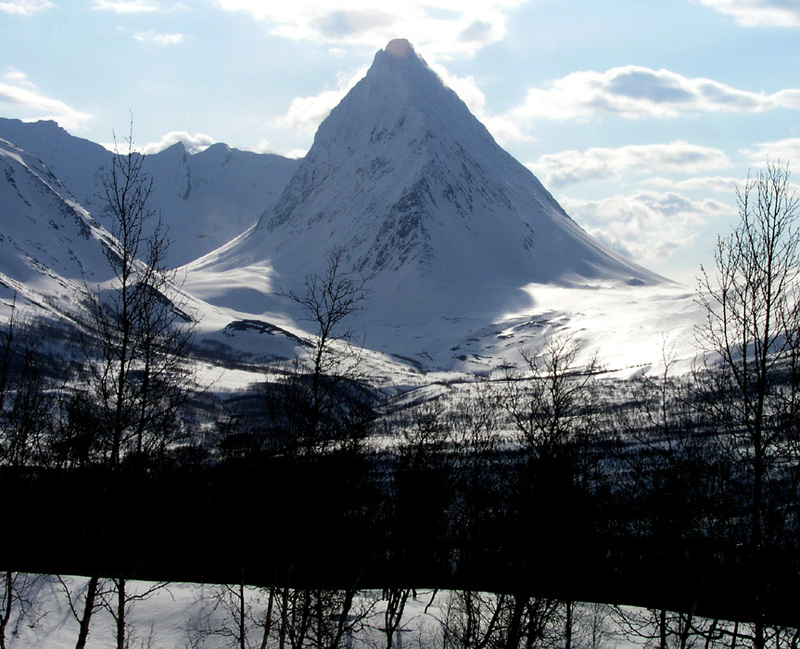 This mountain has several humps, the lake Holmvatnet drains north-east. Get into this drainage and exit left (north) finding a good line across to the saddle Halsen, elevation 410 meter. From here, head up the ridge to north-east, passing point 590 and aiming for point 769. 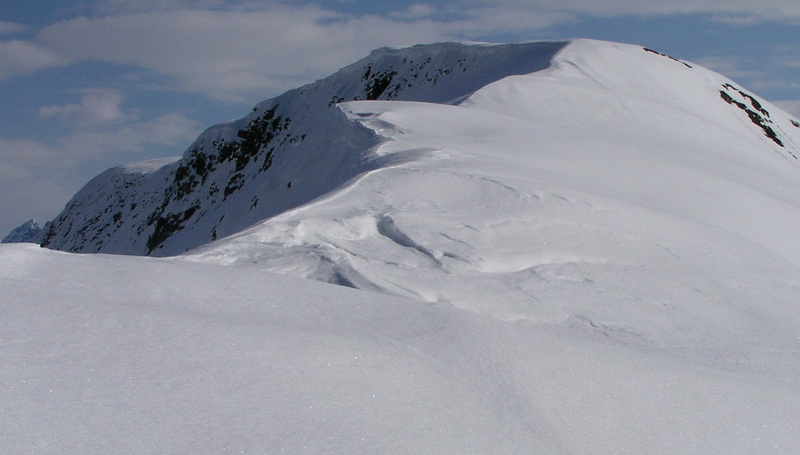 This ridge gets more narrow as you climb, beware of the cornices on your left (north-west) side. Just before the top, there is a 10 meter section that should be skied with particular care as the steepness on your right has increased substantially. 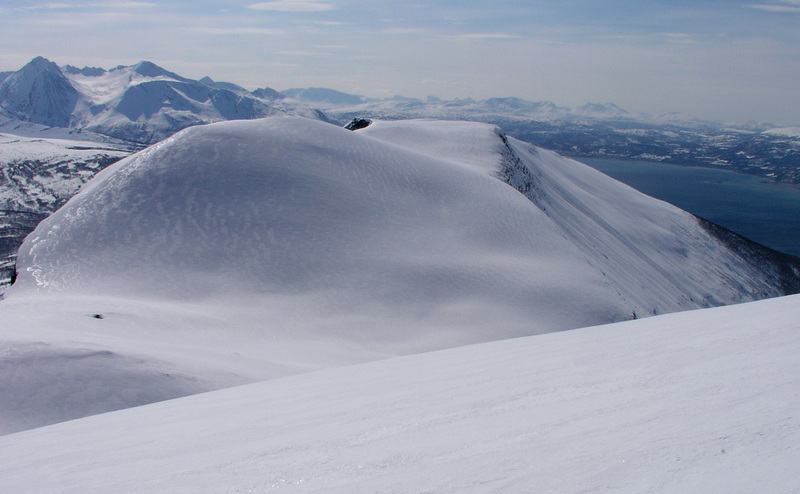 Next, ski along the Kistefjellet summit ridge, this ridge is wide and flat. 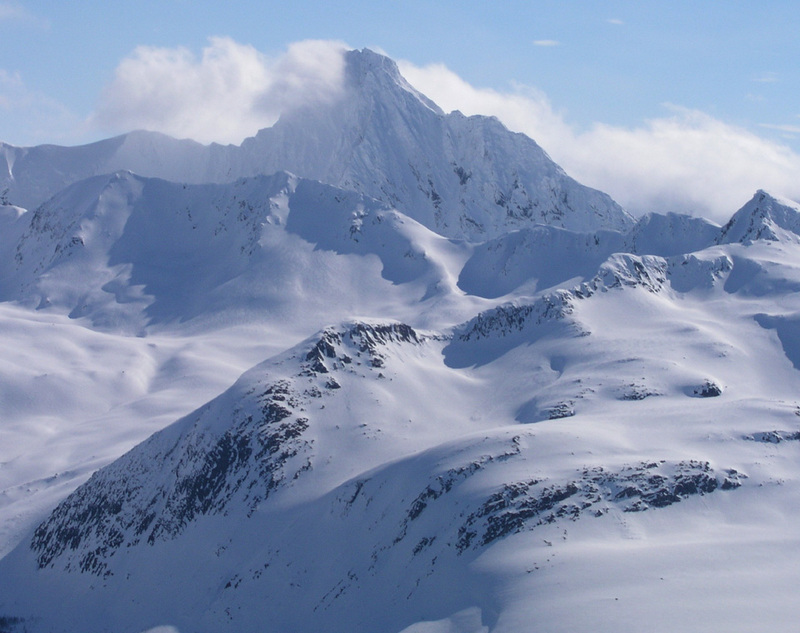 At the far end, visit the Kistefjellet summit, a very nice viewpoint. 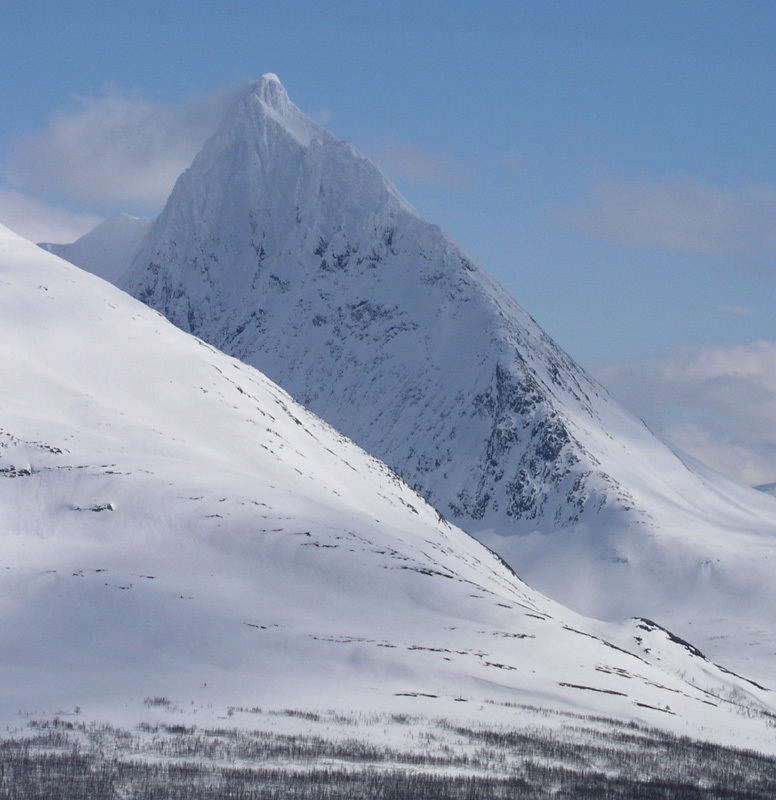 The continued route descends down to the 670 meter saddle north-east of Kistefjellet. The north side of this mountain seemed steeper than expected from reading the map. 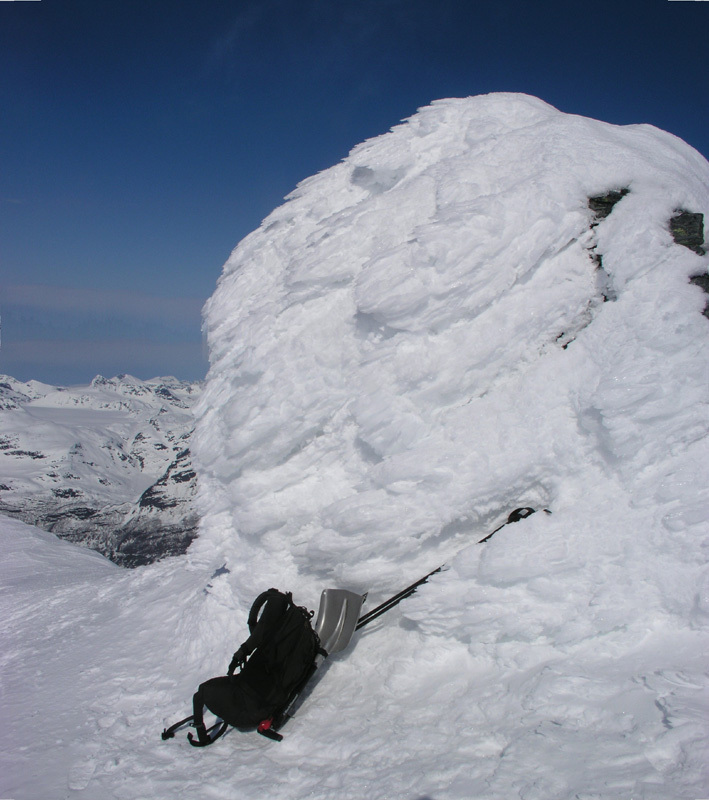 It may be best to backtrack a little, then do a descending traverse north of the summit. 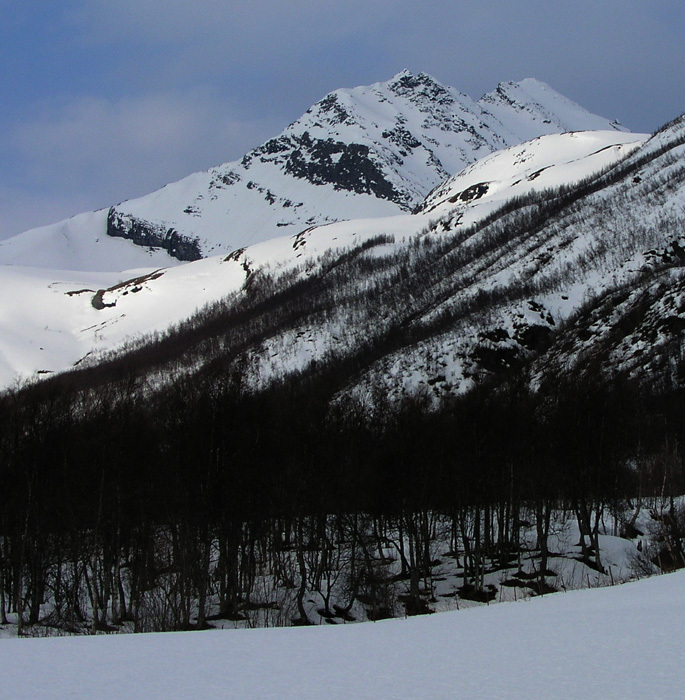 From this saddle, the skiing is easy uphill to point 828 and further north-west in the direction of peak 1106. The pretty steep valley Tverrelvskardet is on your right, contour around and above it on the west side and descend to the 810 meter saddle at the base of Rasmustind, loc. north 69:21.259, east 019:31.186. From this saddle, climb directly to the summit, possibly staying fairly close to the (south-west) ridge. 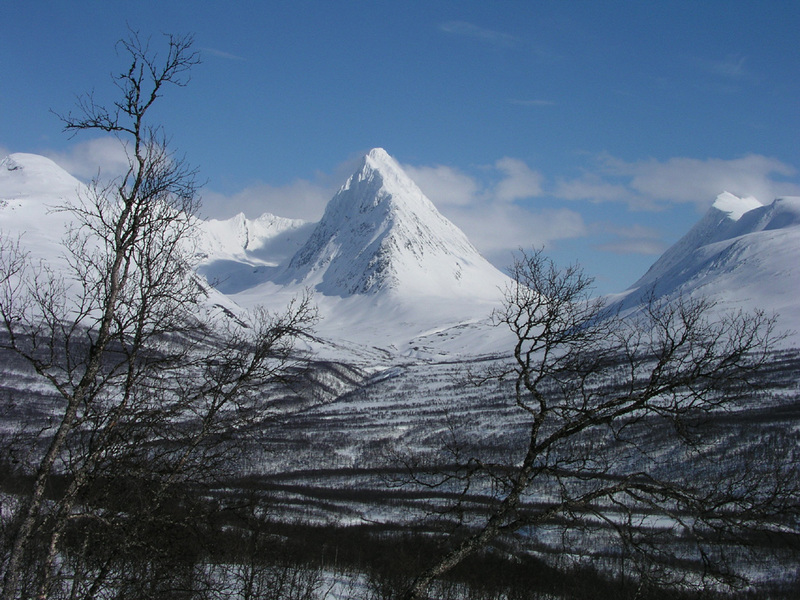 Note: An alternative, shorter and easier route to this mountain starts near the farm Luneng, about 5km east of Laksvatnbukta. This is at the very end of Sørfjorden. This route then proceeds directly south up Tiurdalen to the same 810 meter saddle described above. However, the route across Kistefjellet is more scenic, with spectacular views of the famous Piggtind. A complete traverse of this mountain area is an attractive option, but transport between the two trailheads must then be organized. Comments: I climbed this peak solo. The trip turned out to be harder/longer than anticipated. I started from the trailhead at 0730 and it took a full 3.5 hours to reach the base of the mountain. This was partly due to strong wind. The final slope was icy and since the wind was still gale force, I left the skis in the saddle and climbed the peak on foot in one hour, reaching the cairn at 1200, noon. I found some shelter behind the big cairn and left the summit at 1215. Right across the valley is a fairly impressive peak with a horizontal summit ridge. According to the map, this peak is 1223, one meter lower than Rasmustind. One can only hope that the map reflects the ranking of these two peaks in a correct way. I returned following my route of ascent, but ran into rotten snow below 500 meter causing some extra effort and delay. Finally back at my car at 1520, almost 8 hours - a tough day after the 10 hour Jiehkkevarri trip the previous day. This route is indeed very scenic, the views of Piggtind never stops to capture attention and imagination. This was peak number 2 in my T5 trip. Next peak Hjerttinden. Previous peak Jiehkkevarri. Rasmustind, as seen from the road south of Lakselvbukt. View south, Store Russetinden and Rakeltinden. The route ahead, Rasmustind is the white peak in the distance. View south-west, Blåtindan and Mårtinden. The ridge up to Kistefjell. It is a bit steeper than it looks. Rasmustind, as seen from Kistefjell. Fascinating views. This is across from Kistefjell to Langdalstindane. The summit cairn on Rasmustind. 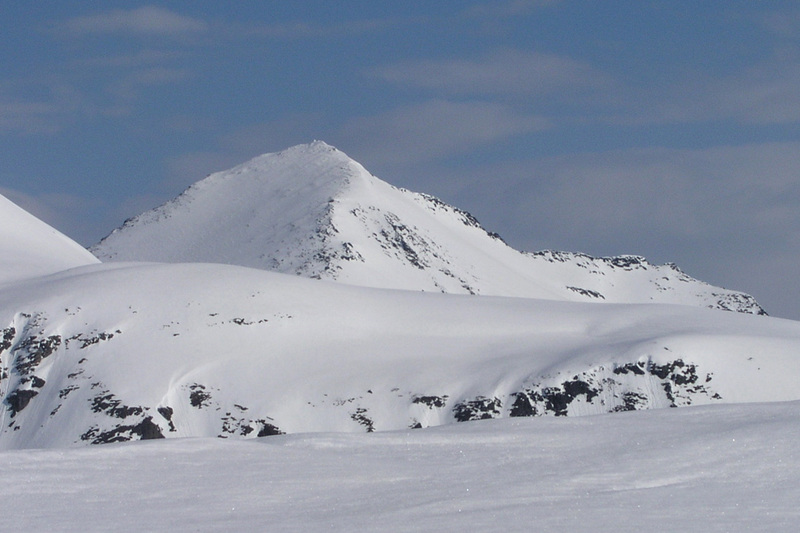 View of Kistefjell, the route traverses this ridge. Here follows the impressive panorama from the summit. Summit panorama I, the view is north to east. Summit panorama II-A, continued east to south. Summit panorama III, continued south to west. Summit panorama IV, continued west to north-west. Below are pictures of Piggtind taken on this trip. Piggtind, it is early morning. Piggtind, this is a famous peak. Piggtind, as I remember her from this day.